Smoke Gets In Your Eyes, But Snow Gets Up Your Nose. It’s a bloody freezing day: at least -16°C (3°F), possibly colder. After a while my camera stopped working; I think the cold must affect the battery, as it does with a car. 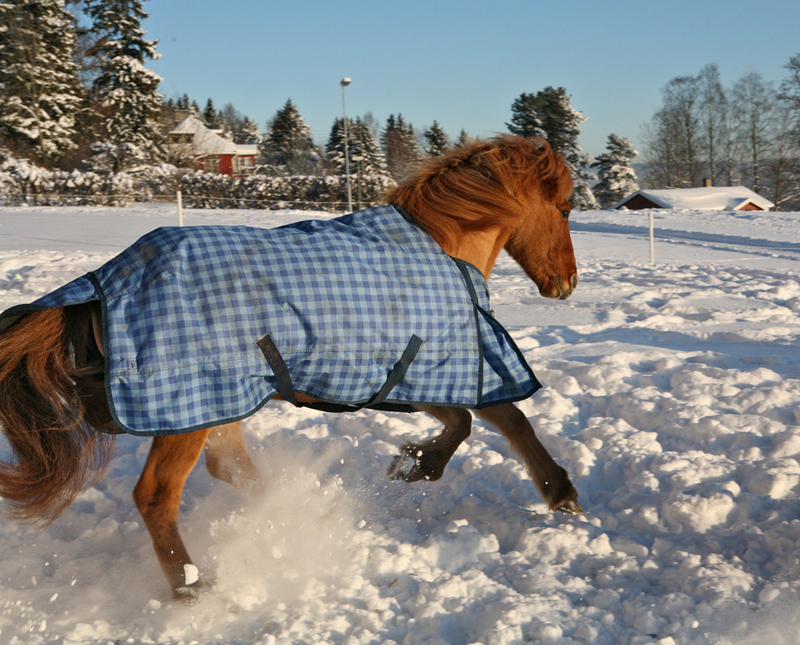 Anyway, it’s never too cold for the horses to want to go outside. 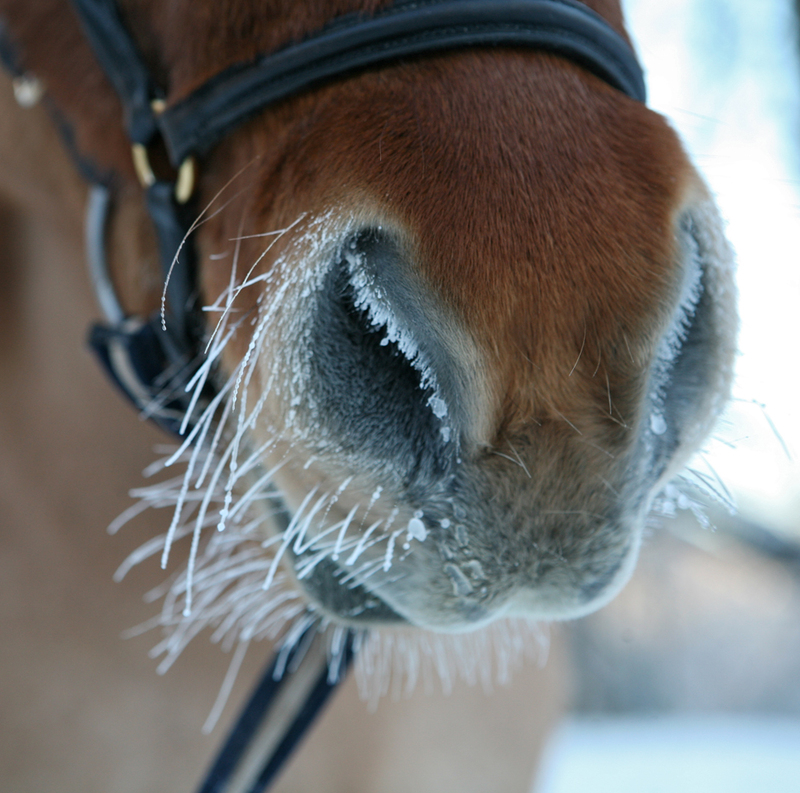 I’ve noticed recently that their nostrils become surrounded by tiny icicles attached to their whiskers. They don’t seem to mind. But we still bathe there. That made me laugh out loud. I wish I could come up with stuff like that. (And how do I count mora into a haiku? rime on a muzzle and not on a bicycle? starting with hay and ending with doody. with pees and with poos, is talking in morse? The Australians favour the Hairu. Happy new year from our warm (hot…) Buenos Aires!! BORING! !… these are too serious! I’ll try harder after some drinks … at night! 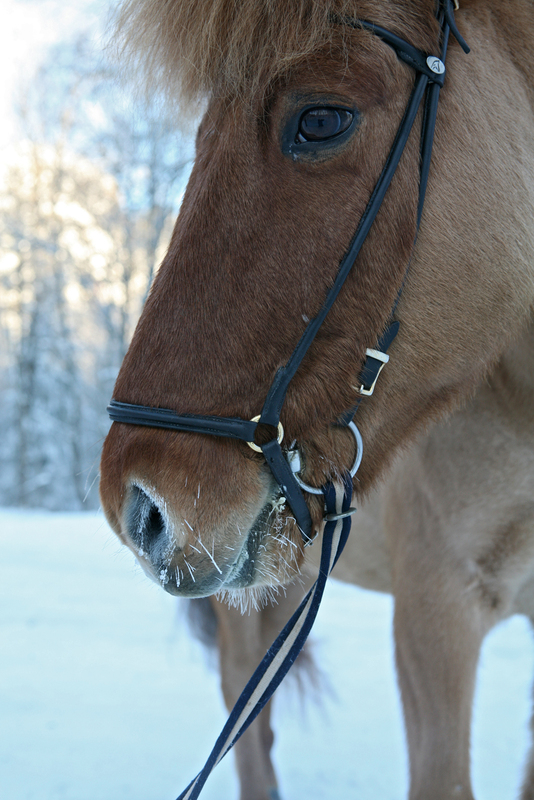 But the thing is I loved your horse-winter pictures. That made me laugh out loud: mø is moo (but also old maid, from møy? -not sure) hei is hey! (sounds like hai, which is shark) and ku is cow in Norwegian. Bruessel has enough talents being equally fluent in at least three languages, thank you very much. Julia: And here are some attempts in Spanish… these are too serious! But how many blogs receive their comments in the form of Spanish Haikus? Which is not to say that I wouldn’t welcome drunken Spanish Haikus too. Raises glass, laugh, my heartbeat. The plural of the Hai Coo is the Hai Kye. Collie drives the kye all hame. Scottish Haikuer are welcomed in the Burnsian spirit of auld lang syne. Not just anywhere indoors, I hope, Ø.
Ah, good reminder. I knew I was forgetting something. A brandy sip will suffice. ‘Mø’ is Danish/Riksmål (danified register) for ‘møy’ “virgin, maiden”, more often young than old. “Old maid” is ‘gammel jomfru’. Scottish coo, kye? Norwegian ku, kyr. Oh, and what is a shielling? Very apposite. A temperance haiku and haikus in two languages. “Old maid” is ‘gammel jomfru’. I’d have said “old maid” is kjerring, but I now see in my dictionary that kjerring implies a married woman; is that correct, Trond? I believe this may be a shielling, but it doesn’t quite work with Dearie’s usage (which may, of course, be Japanese). I meant to say that that was an attempt on a haik-u. Gammal kjerring = old wife or old hag, no marriage required. High pasture used in summer; you drive the kye up there in spring and fetch them back down in Autumn. The Welsh have a word for it too, but I can’t remember it. Here’s a link (note the alternative spelling with one “l”). It seems to me to confuse the pasture with the bothy (hut) built beside it, but people confuse the land and the accomodation all the time with “croft” too. Anyway, maybe they’re right and I’m wrong. But not necessarily. I’ve looked at some dictionaries: shieling/shielling can mean either the pasture or the hut. I’d have thought the distinction too important to elide, but there’s not much reason sometimes to language. Goodness, I didn’t know we had them in Britain too. I suppose it’s Hampstead in my dialect. In Norwegian it’s called a sæter. A seter f. or a støl m. is a summer pasture with houses (but somebody ought to fix the links in that article – the equation with Alpine tundra is ridiculous). The main building is called a sel n., but I don’t think it can be related to shieling. In Sweden the usual term is fäbod or just bod. That word must originally have denoted the building. Actually my dictionary has sæter, as does Wikipedia if you look in the nynorsk entry instead of the bokmål. It may not be as common as seter, but I have a friend called Miss Oldpasture; her name is spelt -sæter, so I use that. ‘Sæter’ redirects to ‘seter’. But I didn’t mean to make an ortographic statement, both spellings are fine with me. I mean, the distribution of æ-s and e-s in Bokmål and modern Nynorsk is a mess. In the French Alps cows are (or used to be) taken to summer pasture too after being cooped up all winter. In order to take care of the cows and milk them, as well as to cut the hay grown above the village (but not as high as the summer pastures) people built smaller, simpler houses called chalets. It was usually young people who were sent up there for the summer, to make cheese and harvest the hay. Unlike a chalet, a proper village house had the animals on the bottom floor, the people just above, and a vast hayloft at the top, open to the winds, for the hay which would feed the animals through the long winter. During that time, people took occasional baths and women gave birth in the animals section, which, although unheated, was warmer than the rest of the house thanks to the animals. How did the hay get into the hayloft? Was there a ramp? And how did it get down to the animals? I’m thinking of doing another post on our neighbour’s cows, next. marie-lucie: This is very similar to Norwegian setring. I broke down this morning and involved myself in editing the Norwegian Wiki articles. Trying to sort out the relation between the different terms internationally, there are several problems, and one is the French. We have a system, setring, a mountain (or woodland) facility with pasture and buildings, seter, and names for the buildings themselves, e.g. a sel “building for accomodation in a seter”. According to French wikipedia the word alpage may designate the facility and the season when it’s in use but not the system. This in spite of it’s form as a verbal derivative and the fact that its Italian cognate Alpeggio is defined as denoting the system. The Welsh have a word for it too, but I can’t remember it. Hafod (I finally read the French article on shieling). It’s also the name of a district in Swansea. It turns out that transhumance is a word for this sort of system. La transhumance is not quite the same as l’alpage. The latter refers to the practice of moving the local cows for the summer to a grassy area above the village, just above the tree line or among the trees (the word also refers just to this higher level), while la transhumance refers to moving large herds of sheep a much longer distance from a region of plains to a mountainous region where they will feed on the sparse vegetation far above the tree line (an ecologically destructive practice as sheep tear up the vegetation, unlike cows which just cut the grass with their teeth, leaving the roots intact). At a time when herds of hundreds of sheep were marched on foot it could take a month or two until they arrived at their mountainous destination, eating along the way. Nowadays they are trucked to the nearest village before making the final climb. It takes surprisingly few people and dogs to look after such large herds (up to 1200 sheep), as well as a few goats, which are much smarter animals and help keeping the sheep from getting into trouble. La transhumance is not quite the same as l’alpage. Thanks, that’s how I understood it, too, and the distinction is an important (although sometimes blurry) one, but it seems that since the practice of shieling (the use of shiels?) went lost in English-speaking countries, the term transhumance has come to be used to describe it. I also see that different words are used in different regions of France, for both houses, pastures and traditions, but I gather that slpage is the closest we get to a common term. And I note that you use alpage as a pendant to transhumance, i.e. for the system. Actually, I did not know that alpage could be used in that sense until this discussion, I only knew the meaning “alpine prairie above the tree line”. But I would never use transhumance for a purely local vertical move handled at the village level, it always involves longer distances and larger herds. I’m not sure, Trond, if you’re saying we have alpage or transhumance in Norway, or if it’s blurry. It sounds to me like transhumance, we certainly have sheep feeding on the sparse vegetation far above the tree line at our cabin in the mountains, but the movement in Norway is done twice a year by the individual farmers and it only takes a day or so to walk the sheep up there. Oddly there aren’t any goats there, now I come to think of it. I’m sure goats are much more destructive than sheep, who mostly eat grass. The traditional seasonal movement of the cattle and the farm’s dairy maid to a seter somewhere above the treeline or deep into the forests is alpage. Sheep can be walked to mountains nearby or transported farther away by truck, but since there’s no dairyfarming involved (and hardly any shepherds except forslepp “release” and sanking “gathering”) it’s not setring but fjellbeite “mountain pasturing”. Transportation of sheep to mountains far away by truck is similar to the modern version of transhumance. To find a Scandinavian equivalent of traditional transhumance, I think one should look to Saami culture from before the development of near-full nomadism around the seventeenth century. By ‘blurry’ I meant that where there’s both alpage and transhumance there will be all sorts of intermediary adaptations locally. It’s getting blurry here, too, with people buying or renting beite far away from their farms in the lowland. A fascinating discussion, I must say. No need to italicize transhumance, though; it’s a perfectly good English word (pronounced trans-HYOO-mns). That’s right, Empty found transhumance. Isn’t there an English word for alpage, or can we use shieling as a verb: to shiel? Perhaps only the French have 40 words for moving sheep. The italization was on purpose. I was trying to describe how a loan of French transhumance came to denote (also) simpler forms of seasonal movement in English, but I think I lost it somewhere. can we use shieling as a verb: to shiel? I wondered about that, too. Somewhere in my reading the last days I found that even ‘shiel’, descended from ON skáli m. “main building on a farm; simple house for accomodation”, was used for the buildings, so there’s at least a possibility that ‘shieling’ was formed to a derived verb meaning “use, go to, stay at the shiel”. And there seems to be some confusion here. The correct term should be transcendence. The sheep or cattle ascend in early summer, transcend for four months and descend in autumn. Transhumance is what you experience between inhumation and exhumation. It’s sad that simple words for simple activities are mixed up with these esoteric concepts. I am reminded of the Exhume Goldwater campaign. I well remember the Barry Goldwater campaign of my youth, a gilded running faucet in our hometown’s campaign headquarters window, with the slogan “running gold water”. Well done. I thought it must be Norsk. Can I help in any way, Stu?